The 2018 National Company Newsletter Competition is now open! Firms will showcase their company updates through the submission of a company newsletter that is unique to the business and its employees, includes the company mission, newsletter content, and consistent branding presentation. 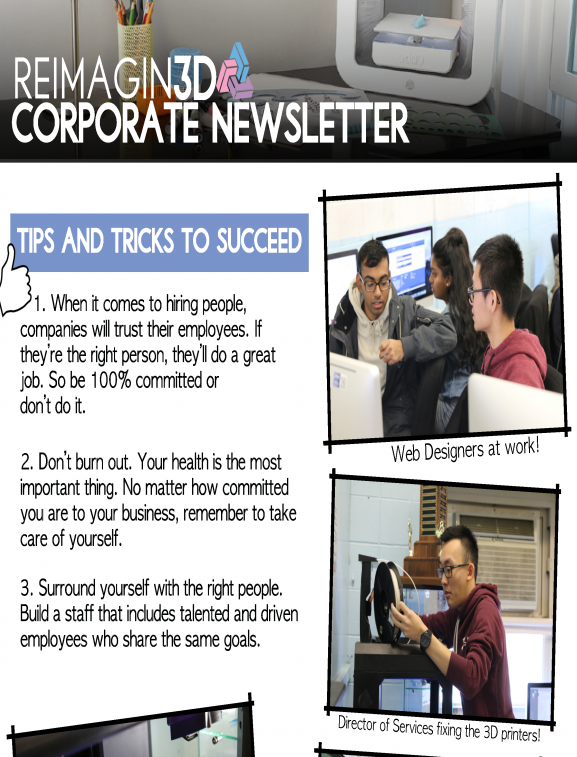 An effective newsletter should communicate information about the company, special events, real world and virtual world news, contact information, and other information the company would like to share. Consult the Newsletter Rubric available at Portal / Competitions & Rubrics / Rubrics to review submission criteria, judging criteria, Career Readiness Framework alignment, and the scoring key. Remember to review previous company newsletter submissions and effective newsletters made in the real-world. When you’re ready, use the Competitions Manager linked below to register and submit. You can view previous top submissions by going to Competition Results. We’ve selected the following previous submissions to help demonstrate what a successful newsletter looks like according to the different submission elements. View Vitality’s newsletter to read their strong mission statement. View Legacy’s newsletter to get design inspiration. View Nomad’s newsletter to see organized content. View Reimagin3d’s newsletter to read interesting, relevant content from the company.